NOTE: I discovered this first dream in my journal, after this page was already published: Surprise! Surprise! Surprise! 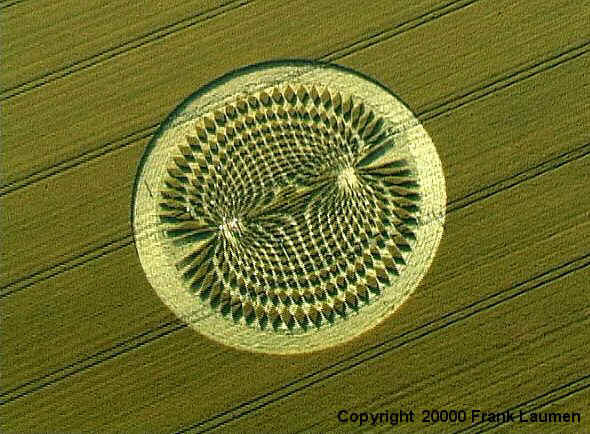 Subj: DID THEY CALL THAT CROP CIRCLE A 'MOIRE'? 5-28-00 - DREAM - This dream left me feeling disturbed somewhat because I don't understand it. I was on 12th St. in Milwaukee. The High School I went to was on the east side of the street. On the West side, some farmer or someone was plowing up the entire area and the soil was turning to yellow powder. It seemed like he was plowing it into useless nothing....??? I went to an outdoor bathroom and changed clothes. I put on a man's pair of black and white checked shorts with straps to hold them up. They also had a series of large black buttons down the front which seems superfluous but they all had to be buttoned. I had to step into these shorts from behind, through the straps. It was kind of confusing but once they were on and I buttoned them, they fit pretty good. I then went to a shopping mall where women were dressed like women in suits and high heeled shoes and for some reason I was angry or something and was throwing low heeled shoes at them like I was angry. I woke up feeling rather this way also. I then had a vision which was the word 'moire' which I've looked up. It seems to be a pattern of black and white which shifts as you look at it. Seems to kind of match the black and white shorts I was wearing. As I was waking up, I began to see a series of visions which didn't seem to be related to anything I was doing. They seemed to be related to a dream I had earlier in the night about Extraterrestrial messages I was seeing on a computer screen. The following visions are possibly messages I needed to deal with. I saw three 'band' names which I can't remember, but the songs they sang were like, "Everything comes in puzzle form", and "We don't answer questions." or something like that. I can't recall the third one. One of the band names I think was Hubbard ... The band names and songs faded so fast I almost couldn't remember them at all. I feel lucky I remember what I do. It seemed like the band names were short and should have been easy to remember, but I was thinking the messages were more important than the names. At this time I was thinking it was music related. I then saw a bright sheet of paper like a brochure. The name Hubbard was on it twice and it seems that Hubbard was also one of the band names I had forgotten. This was one of the lines ... ' 78 words'. I went to look at it since we study crop circles and was pleased to see such a great glyph. I then quickly became aware that Hubbard was well known in the field of magnetic fields and that was exactly what the crop glyph was about. 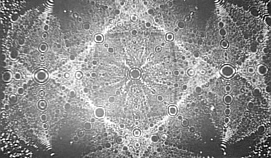 What a coincidence ... my visions were actually telling me that 'music' of the spheres were connected to the 'magnetics' of condense matter structures. Music/sound/vibration/frequency is the creative force What a thrill to discover the connection ... from the puzzle of the visions to the crop glyph that just appeared two days ago. It doesn't take much guessing to see that some of those words fit the topic as well. this is what was intended by the makers of the crop glyph. Examples of Moire patterns are shown below. that passes through all material and immaterial matter. years, magnetism was considered a child of electricity. affect animal systems in two distinct and opposite manners. magnetism is the father of electricity, rather than the child. *What are magnetic fields doing in the middle of nowhere? of galaxies-is pervaded by magnetic fields of unforeseen power and unknown origin. "These magnetic fields are the dominant free energy of the universe," says astrophysicist Stirling A. Colgate of Los Alamos National Laboratory. of electrons, for example, a magnetic field can effect the emission of polarized radio waves or skew the polarization of light passing through a region of space, rather like a weak pair of polarizing sunglasses. of roughly five microgauss, generally directed along the galaxy's spiral arms. 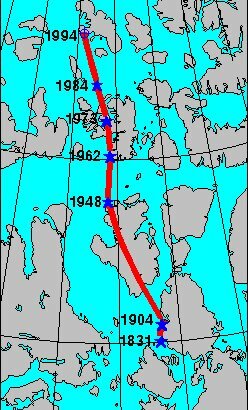 (By comparison, the earth's north-pointing magnetic field is about 500,000 microgauss.) If you had a compass sensitive to this field, in our corner of the galaxy it would point toward the constellation Cygnus. Other galaxies have similar fields. When researchers began to look for fields in between galaxies in the late 1980s, their expectations were low. After all, cosmic magnetic fields are embedded in plasmas, which are much thinner in intergalactic than in interstellar space. According to x-ray telescopes, even the thickest intergalactic plasmas-found in the cores of galaxy clusters-are a hundredth as dense as interstellar plasmas. can no longer be ignored in models of galaxy formation and other celestial goings-on. more daunting. A galactic field must somehow be generated from scratch, amplified to the strength now observed, ejected into intergalactic space and further amplified there. Each stage poses problems. And some worry that ordinary galaxies simply lack the oomph to magnetize the huge space between them. Colgate and his colleague Hui Li think it is a job for the biggest guns in astronomy, the black holes at the heart of so-called active galaxies. "The only place where you have that much energy is a supermassive black hole," Colgate says. particles' paths. If so, M87 can't be ruled out after all. also be responsible for the particles. In any event, it looks like cosmic magnetic fields will retain their lure for some time to come. Gate of Giza. The Seal of Orion also exists within the human body. the higher chakra centers (8-15), the KA and dormant DNA codes. Orion within the Giza complex and within the bio-energetic fields of those attending. 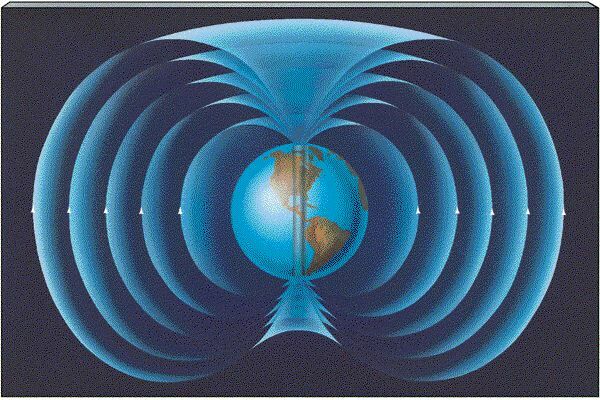 Our research on the harmonic content of the heart EKG, when loving compassion is achieved, suggests an important connection to the 'Zero Point' energy. I'd like to suggest a specific mechanism which permits the harmonic series in the EKG spectra to access the 'Zero Point Energy' (reference literature by Henry Moray, and Moray King). Specifically this mechanism is fractality. Our wave model of emotion predicted that we would find coherence in the EKG during loving. We did. Our wave model predicted we would find increased braiding in DNA during EKG coherence. We did. Our wave model predicted that when the heart became a 'sonic laser' we could measure phase lock between the heart and major biomagnetics in the environment (example: a tree). We did. We have even measured the EKG phase lock or entrainment which occurs between people specifically at the moment they hold hands! 3D wave modeling clearly indicates that fractality is the specific mechanism which creates center of gravity as well as self-awareness in a waveform. The lo-frequency phi pent array (dodeca nest) permits/optimizes the densest possible recursion/fractality/self- embeddedness in 3D. Hence the Immune identity in the electrical waveforms around the heart must therefore arise when the geometry of focus called emotion learns to create fractal nesting among many incident pressures. The resultant self-embeddedness permits the context-richness in harmonic series accounting for what has been called 'multiply connectedness' in holography. This must also describe the information physics for the onset of intuition. Thus, the hearts access to the hyperbolic spin/information densities of the 'Zero-Point' energy is specifically derived from its whip cracking harmonic series, translating vorticity contiguously up the caddeuceus harmonic scale. Notice the harmonic content in the EKG cascade going hyperbolic right at the approach to 0 hz. Only the completed fractal of this cascade means spin can reach out from the still point, without interference. The challenge facing the human gene pool to information embed itself in its galactic ecosystem is directly related to understanding how fractality works. 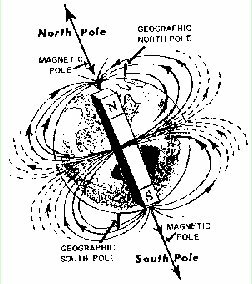 Shift in the Earth's Magnetic Field Cause Of Extreme Weather? I will publish appropriate comments with permission.